Lately I have been trying to read more faith based books, because I find it helps me to focus on the good in my life rather than the negative. 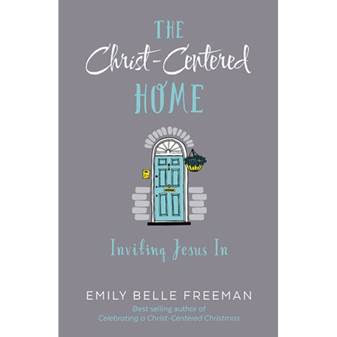 The Christ-Centered Home by Emily Belle Freeman shares 12 practical lessons (one for each month) to help keep Jesus in your home. At the end of each chapter there is a discussion question for reflection and a snack recipe that the entire family can enjoy. Freeman shows you how to weave uplifting conversations into your daily routine, allow the teaching of Jesus to overpower the messy reality of life, and how to find grace in the ordinary. Having a teenager that just finished his first year of high school, I am being more intentional than ever in setting a Christian example and having conversations about peer pressure. Our home should be a refuge from the hectic outside world. If we invite Jesus into our home and make his teachings a part of our everyday life (not just when we are at church), then I think peace can be attained. I think the chapter that hit home with me the most was seven: Find Grace in the Ordinary. Sometimes we are so busy and focused on the task at hand that we fail to see everyday miracles God places in front of us. Freeman recounts the story of Peter finding the fish with the coin in its mouth, which was the correct amount for paying the taxes. Jesus orchestrated a miracle in an ordinary circumstance. There have been times in my life that things like this have happened, even though I may not have realized it at the time. One specific time that immediately comes to mind was how he provided when I locked my keys in the house. My husband and I were riding to work together at the time and we both thought the other one had the keys, but neither of us did. I happened to have a spare set of car keys in my purse so we were able to get to work (and deal with how to get into the house later). It just so happened that my ex-husband asked if I could keep our son that night (not my scheduled night) and while trying to figure out how to get in the house, we realized that the kitchen window was unlocked, so we were able to have our son crawl through the window and unlock the door. All of these seemingly ordinary and unrelated events made a way for us to easily solve a problem! This is a great read, especially if you want to incorporate it into family devotion time, since there is a chapter for each month. It has made me more intentional about making time for Jesus daily and finding His hand in the seemingly ordinary tasks of everyday life. Disclosure: A special thanks to Shadow Mountain Publishing for providing a copy of this book to review. The Christ-Centered Home can be purchased wherever books are sold. Emily, I honestly have not experienced this issue, but I have a Dell laptop. I am sorry I cannot help. This looks like a great book! I need a new book to read (when I can find the time again!). Let me know when you want to borrow it!